The phenomenon Stone Wedding is probably the most interesting rock formation, which can be seen among the so called, Kardjali pyramids. They represent a large group stones of which have eroded into bizarre shapes on different scales. The Kardjali pyramids are situated on the hills in the Eastern Rhodopes, only a few kilometers from the town of Kardjali. 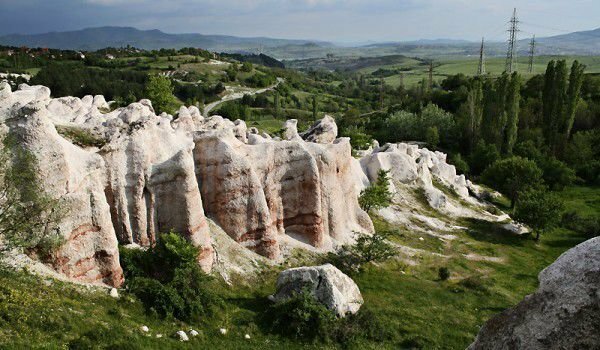 These beautiful natural formations are among the most visited by tourists of natural pyramids in Bulgaria. Furthermore located near the village of Beli Plast is the Stone mushrooms phenomenon. The Stone Wedding raises the curiosity of people with their unique forms in which one can easily recognize the images of people, animals such as horses and birds, pillars, and some which have left its visitors very impressed with one sculpted into volcanic tufts. 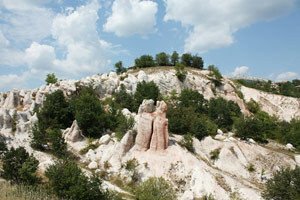 Stone Wedding was formed near the village, Zimzelen only about 4 km east of Kardjali. These intriguing rock formations extend the total area of about 40 acres, they represent a unique and beautiful view. Most of the rock pieces reach a height of about 10 meters, and the presence of various metal oxides in the rock gives them a variety of colors, as Stone Wedding is interesting being colored in pink, red and brown. In the year of 1975 the phenomenon, Stone Wedding was declared a protected site. According to scientific calculations and assumptions, Stone Wedding started forming 40 million years ago. At that time the territory of Eastern Rhodopes today was located at the bottom of the warm, shallow sea. There the relief continuously changed under the influence of active volcanic activity. Once you have withdrawn water, precipitated by the volcanic ash and rocks the rocks of the beautiful Stone Wedding Stone Wedding were formed. In essence, they are riolitovi tufts, which, after a lack of water in the region are made. From there onwards erosion from the force of the wind, rain and the sun began shaping today's millennial natural phenomena near Kardzhali. The varied mineral content contributes to the diversity of the Stone Wedding, dying them in nice colors. The name, Stone Wedding is given for several rock formations in which a good imagination can be assimilated. On the natural wonder of the Stone Wedding there is a beautiful legend, which tells of an unhappy love affair. The story tells of a young man who loved a girl from a neighboring village. He was enchanted by her lovely eyes that were blue as the sky. At that time the girls had to wear mandatory veils, with only their eyes visible. The young man was haunted by her eyes and more and more had to glimpse at the face of the girl. The father went to the girl's parents and after some persuasion was able to redeem her. The weather on the day of the wedding was severe and across the road to the village suddenly blew strong winds that blew away the veil of the bride. The indescribable beauty of her at the wedding took everyone’s breath away. Then her father in law became jealous of his son and because he thought of the impure natural forces he led all to be petrified. Natural disasters fulfilled the grooms request, resulting in the phenomenon of Stone Wedding today, standing next to a pool that is considered to be wet with tears of the woe bridegroom.